My cousin asked me to make a Bratz birthday cake for her daughter Dominique who was turning 7 and she thought it would be a nice idea to decorate the cake with the same theme as her birthday invitation. The cake was a 13” lemon sponge cake with white butter icing in the middle. The cake was then covered with white butter icing and when dried covered with pink sugarpaste icing. The large star was made from sugar paste which was colored with electric purple. The smaller stars were made from the left over pink and purple sugar paste. The high heeled shoe was cut from white sugar paste from a shoe mold and the bottom half was colored with black food coloring and sprinkled with glitter. At a local cake decorating shop, I found the 4 Bratz figures, the red lips and girls clothing, handbag, lipstick, mirror and thought it would be a nice idea to put them around the sides of the cake as kids are always looking for decorations to take off the cake. The Bratz, Jade, Dominique and the number 7 were printed on a sheet of sugar paper and were cut out carefully. Before sticking the large purple star on the cake a section of the star was cut out where Jade was placed on the star so that Jade fitted nicely on the cake and then the end bit of the star was placed on the cake. Following that, the name Dominque was stuck on the star with a little butter icing. 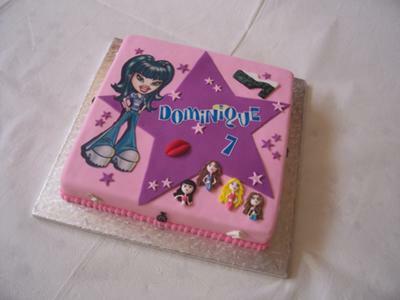 Once Dominique’s name, Jade, the lips, the 4 Bratz and the shoe were placed on the cake the smaller stars were placed just to finish off the cake. The cake was loved by all especially the birthday girl. wow, this is such a lovely cake. you really did an excellent job. well done.